Those who suffer from panic disorders are most often terrified about the possibility of triggering their next panic attack. This is a mental disease that many people associate with depression and poor stress management. Fortunately, there are plenty of warning signs before the onset of any attack, and your ability to single out these signs should enable you to prevent the onset of one. The most important remedy while fighting against a panic disorder is to take action. Do not wait for it to wash over you; do not wait to pit your strength against it and measure your will power against the storm that is created by an anxiety panic attack. 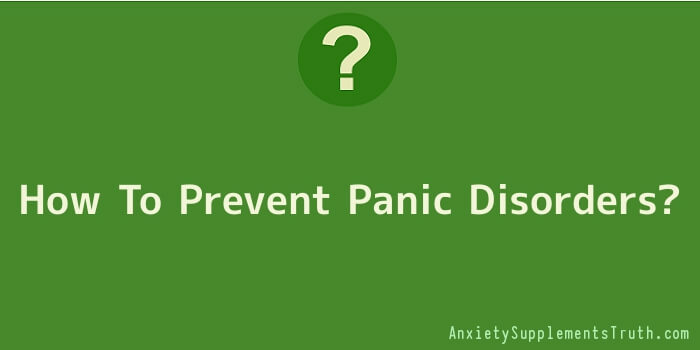 The best way to stop panic attacks is to prevent them. Traumatic as it is, a few simple steps at the onset of an attack can help you tremendously. Most experts would say that you should not brace yourself against it, but rather roll with the wave. In this way, the attack will come and go, and you will not feel devastated the next day. Life can look totally different if you look at it from two different angles. People who are affected by panic disorders tend to think that they have no worth. This in turn points to the possibility of moving toward a major attack, unless you are able to prevent it in time. Be on the lookout for depression and anxiety tell-tale signs. When you suffer from panic disorders you need to find out what type of picture you have in your mind about yourself. If that image is more negative than positive, then you are definitely headed for major physical and mental trauma. There are two things, according to the health experts, that can help you when you feel an attack building up within you; appropriate medicine and timely action. Hopefully, you have taken all precautions.